Today I am partnering with Webster Ltd – the largest commercial producer of premium-quality walnuts in Australia – to present to you the ultimate Christmas dessert: Walnut Semifreddo with Walnut Cherry Brownies and Cherry Compote! Yes, you read that right and it tastes as decadent as it sounds! I wanted to create something that would go well for both a summer and a winter Christmas, so I thought a semifreddo would be perfect. As you may know, semifreddo is a classic Christmas dessert in Italy, and it also works very well in summer being similar to ice cream! The best part is, you don’t need any special tool to make semifreddo, so everyone can make it at home! The entire recipe is actually very easy to make, even though it has a few steps to it. However, some of the components can be made a day or 2 in advance (and that includes the semifreddo!). I think that walnuts, cherries, and chocolate are a match made in heaven! And there is also a hint of caramel in the bark, just because! 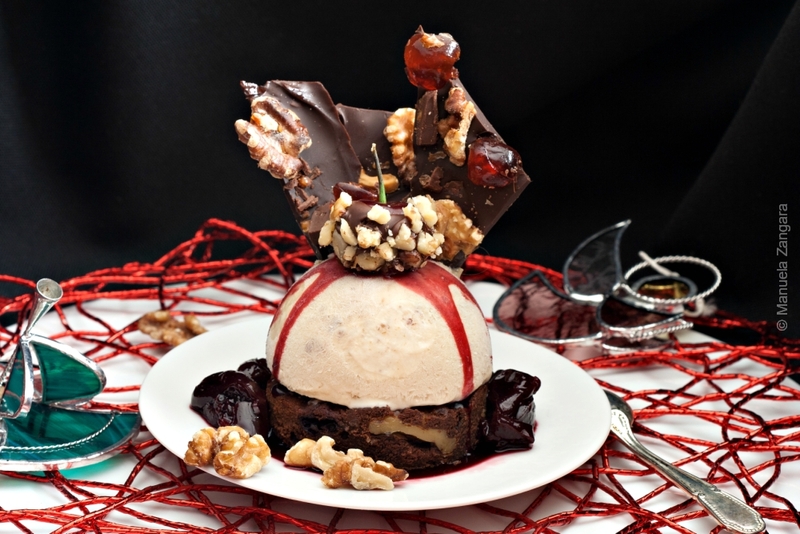 This dessert is made up of a walnut cherry brownie base that is then topped with walnut semifreddo, drizzled with some cherry compote, and topped with walnut and cherry bark. I also dipped some fresh cherries in melted dark chocolate and rolled them in crushed walnuts to use as extra decorations, because they are in season. All the single components of this recipe are amazing and work perfectly well on their own, but when put together they simply create magic! And that’s what you deserve this Christmas! Merry Christmas everyone! Webster Ltd is the southern hemisphere’s largest producer of premium in-shell and kernel walnuts and accounts for around 90% of Australia’s annual walnut crop. Their walnuts are recognised among the best in the world. Webster’s orchards are located in both New South Wales and Tasmania, but their walnuts are available abroad as well, so make sure to look for them. This Walnut Semifreddo with Walnut Cherry Brownies and Cherry Compote is beautifully presented and it is the ultimate Christmas dessert! Walnuts, cherries, and chocolate are a match made in heaven! Roast the cherries in a preheated oven at 230°C – 445°F for 10 minutes, or until they begin to release their juices. Remove the pan from the oven and reduce the temperature to 175°C – 350°F. Line a 20x30cm (8x12 inches) baking pan with baking paper. To make sure the baking paper covers the full area of the pan, wet it completely and squeeze the water out. This way, it will become pliable and easier to work with. Add the warm chocolate mixture and stir until incorporated. Then add the flour with a wooden spoon until just combined. Gently fold in the roasted cherries. Bake until slightly puffed and a toothpick inserted in the centre comes out with a small amount of sticky crumbs clinging to it (this will take approximately 35 minutes). Let the brownies cool down completely inside the pan (this will take about 2 hours). Remove the brownies from the pan and cut into 6 rounds of 7cm (2 ¾ inches) with a cookie cutter. Toast the walnuts in the oven at 210°C – 410°F for about 10 minutes. Make sure to stir them a couple of times, so they don’t get burnt. Let them cool down. Line a 20x30cm (8x12 inches) cookie sheet with baking paper and keep it aside. In a double boiler, melt the chopped chocolate. When melted, quickly pour into the lined cookie sheet and spread evenly. Add the toasted walnuts, chopped candied cherries, and chopped crunchy salted caramel chocolate on the top. Refrigerate for a couple of hours or until firm. Toast the walnuts in the oven at 210°C – 410°F for about 10 minutes. Make sure to stir them a couple of times, so they don’t get burnt. Let them cool down completely, then use a mixer reduce them into a coarse powder. Whip the cream with the icing sugar and keep aside. Put the water and sugar in a pot. Bring to a boil and let this syrup simmer for 5 minutes. Let it cool down. In the meantime, beat the egg yolks with an electric mixer until white and fluffy. Slowly add the lukewarm syrup while whisking. Transfer the mixture into a pot and cook in a double boiler for 10 minutes. Let it cool down. When the egg and syrup mixture is cold, gently fold in the whipped cream and the minced toasted walnuts. Pour the mixture into 6 spherical moulds of 7cm (2 ¾ inches) in diameter. Keep them in the freezer overnight. Walnuts’ health benefits in a… nutshell! Walnuts score a perfect five out of five under the new Australian Government Health Star Rating system. This is because walnuts are naturally low in sugars and sodium, and packed with nutrients: healthy fats (plant omega-3 ALA), protein, fibre, antioxidants, as well as vitamins and minerals – folate, thiamin, magnesium, potassium, manganese, and copper. Walnuts help maintain heart health, as among all the dietary plants and nuts, they contain the highest amount of antioxidants. They are also loaded with omega-3 fatty acids that lower bad cholesterol and increase the production of good cholesterol making it a great snack to keep your heart in great health. Walnuts also help promote brain health, as they help destroy harmful free radical chemicals that cause dementia. Walnuts also have cancer-fighting properties and they help regulate sleep patterns, as they contain melatonin. This is a sponsored post, but the opinions in this post are my own. Amazing and delicious. I will surely try this. Thanks for sharing.